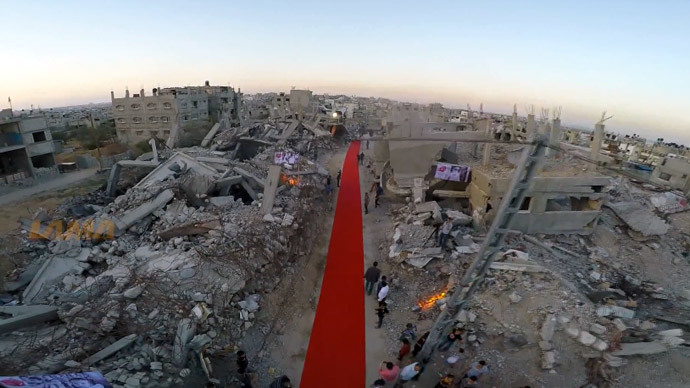 In eastern Gaza City, among ruins and memories of war and destruction, a red carpet was laid out for a film festival on human rights. The event was held amidst rubble in the Shujaiyeh neighborhood, where some 100 Palestinians died in last year's Gaza war. The Karama ('Dignity' in Arabic) Human Rights Film Festival was the first of its kind to ever be held in Gaza – and the chosen location was just the “right place” to hold such an event, according to organizer Saud Aburamadan. “When we were looking for locations to screen the films we arrived in Shujaiyeh in eastern Gaza City, a large part of which was turned to rubble. We stood there next to the destroyed mosque, surrounded by destroyed homes in every direction, and became clear that it was the right place to hold a film festival focused on human rights,” Aburamadan told +972 Magazine. A red carpet was even rolled out among the wreckage. But instead of hosting VIPs in designer gowns, it provided a walkway for anyone and everyone – and delivered a pretty significant message. “We laid down the 70-meter red carpet on one of the main roads that leads to where we screened the films, a road that has nothing but destroyed homes. We invited all of the residents to walk down the red carpet to the premiere. It was our way of saying that each and every one of them is important,” Aburamadan said. But the carpet also served as a painful reminder of last summer's Gaza war, which led to the deaths of some 2,200 Palestinians – mostly civilians – and 73 Israelis. “For us, red is first and foremost the color of so much blood that was spilled here this summer. The blood of women, men and children,” Aburamadan said. Around 100 Palestinian deaths took place in Shujaiyeh alone. Thirteen Israelis also died there. Hundreds of residents showed up to the festival on opening night, along with others from different parts of Gaza. Pictures from the event, which screened documentaries outside, showed a full house. Every available chair was taken, while others stood on mounds of rubble to get a view of the films being showcased. Some were shown watching the films from the windows of their houses. Aburamadan stressed that the setting was a rare one for Gaza, which hasn't had a single movie theater since the First Intifada. The Karama Human Rights Film Festival, which ran from May 12-14, consisted of 180 films from countries including Syria, Iraq, Egypt, Jordan, and Russia. Twenty-eight of those were screened over the three-day event.